KIEV, Ukraine -- Russia's top natural gas producer, Gazprom, will eventually lose more than it gains from raising the gas price for Ukraine by 80 percent, analysts said on Friday, predicting Kiev would cut purchases and fail to pay in full. Gazprom on Thursday announced a price rise for Ukraine to $485 per 1,000 cubic metres, the second increase in three days. The $485 price is the highest of any Gazprom customer and compares with around $370 on average for clients in the European Union. 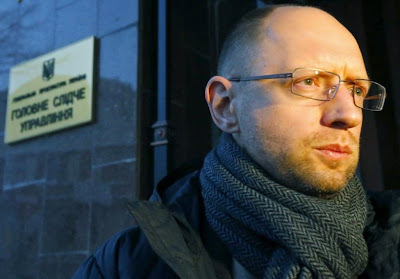 Ukrainian Prime Minister Arseny Yatseniuk said the increase, two weeks after Moscow annexed Ukraine's Crimea region, was unacceptable and warned he expected Russia to step up pressure by limiting supplies to Ukraine. "Even if the price is legally justified, it would hurt Gazprom's image, will hit capitalisation and, indirectly, the whole Russian stock market," Valery Nesterov from Sberbank CIB said. Analysts including Nesterov estimated that Gazprom could lose around $2 billion this year from the move. Previous pricing spats have prompted Russia to halt supplies of gas to Ukraine, with consequent cuts in gas flows to Europe, where Russia meets 30 percent of demand. Analysts said Gazprom may turn the taps off again, although immediate cuts are unlikely because of lower gas demand now that winter has ended. Around half the Russian gas delivered to Europe goes through Ukraine, which ships it to Europe from storage sites in the west of the country. "Ukraine is unable to fill up its gas storage facilities at this price. Without Ukrainian storage gas, Gazprom is unable to fulfil its European export contracts," Mikhail Korchemkin at East European Gas Analysis said. The two price rises ratchet up pressure on the former Soviet republic following the ouster of President Viktor Yanukovich, who had won a price cut from Russia after aborting plans to sign political and trade pacts with the European Union in November. Gazprom said it would raise the gas price from $268.50 starting this month after Kiev failed to pay its gas debt of around $2.2 billion on time and after the Russian government introduced an export fee of around $100 per 1,000 cubic metros. "With a price like this, Ukraine is likely to continue importing gas and increase its debt. This will go on until they decide whether to go to an arbitration or until Russia decides to cut gas supplies to Ukraine," said Valentin Zemlyansky, a former spokesman for Ukrainian state energy company Naftogaz who says he is an independent analyst. Analysts said the jump in the gas price is detrimental to the fragile economy in Ukraine, which would swiftly run into problems paying. "The price looks unrealistic for the long term," Nesterov said. Last year, Gazprom sold 25.8 bcm of gas to Ukraine worth $12 billion, down from 33 bcm in 2012. Russia now meets around half of Ukraine's gas needs. Nesterov said that Ukraine is likely to buy less than the 25-27 bcm previously expected for this year. He estimated that Gazprom would lose $2 billion this year from the price hike and introduction of an export duty, while its production would decline by up to 5 percent. Alexei Kokin, of Uralsib Capital, also expected Gazprom to lose about $2 billion this year as a result of the price hike for Ukraine, which he predicted would cut gas purchases from Russia to 20 bcm this year and to 15 bcm in 2015. Analysts said the crisis could drag on until winter - the season when Gazprom has cut gas supplies to Ukraine in past pricing rows. "I think a gas conflict will happen in the winter," Kokin said. Nalogova Systema in Ukraine must be such that every region will collect its own sale's Tax, property Tax, road Tax, fuel Tax for roads between regions, other local Tax and keep the money in the region. Center must collect it's center's sale's Tax, pension Tax, and other Tax and keep it in center. In ether case each region must have right to regulate majority of local Tax and keep it. Center set it's own Tax for defense and other Tax. That is really interesting. You are a very skilled blogger. Really looking forward to read more. Please visit our website for more information about Russian systema.